Objectives: This research was carried out for describing, illustrating and treating a new medicinal plant variety in the genus Trichosanthes. 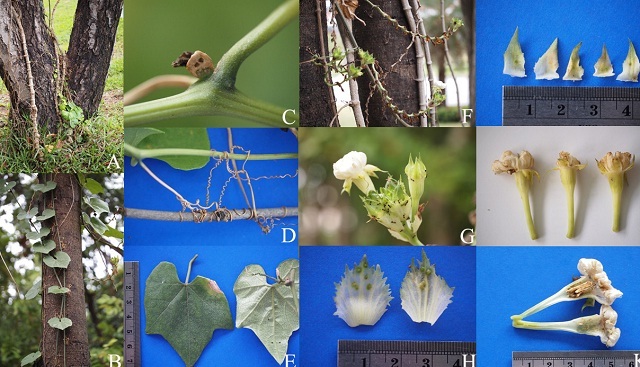 Methods: This research was carried out by collecting plant specimens in the Northeastern Thailand. Morphological characters were studied and compared with the closely related taxon and taxonomic literatures. Results: T. tricuspidata subsp. rotundata var. longirachis, was found. This plant is described and illustrated here and treated as a new variety. It differs from the other of T. tricuspidata subsp. rotundata by having the following combination characters: Comparatively stout herbaceous climber up to 20 m long, tendril 3–5-brached, probract obovate with obvious glands, mature blade unlobed or 3-shallowly lobed with 1-2 short angles, blade not deeply lobed (unlobed blade found in juvenile plants), blade size 5-11 cm diameter and raceme rachis length 10–130 cm. Its fruits and seeds were used as medicinal parts. Conclusion: Totally, three subspecies and four variety of T. tricuspidata in Thailand have been recorded so far. Important comparative morphological characters with some closely related variety are discussed. The local people used it as medicinal plant. Chatan W, Promprom W. New Medicinal Plant Variety of Trichosanthes tricuspidata Lour. (Cucurbitaceae) from Northeastern Thailand. Pharmacognosy Journal. 2018;10(1):29-32.